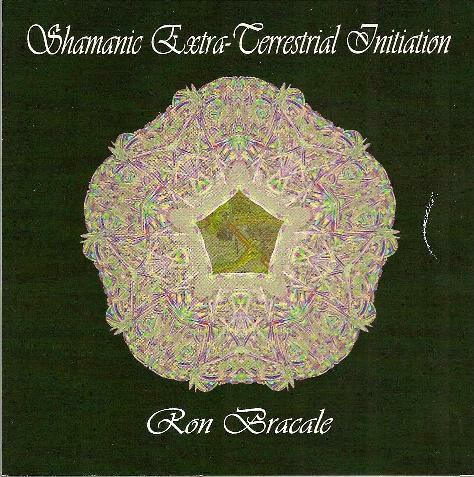 Ron Bracale - "Shamanic Extra-Terrestrial Initiation"
Electronic instrumental music for exploring the extra-terrestrial web. The CD cover states proudly. Fair do Guvnor I'm game! I get a feel for it straight away, and with the rush of first contact I'm beginning to receive the first chapter of the new Book of the Law. The synthesizers bubble and oscillate, lead lines stab me until sublime wisdom seduces me to put pen to paper, remembering the ancients in form of demons purposing to be the Gods from the stars, I write it down. Soulless, starless, blackness. I am the watcher of night. Tangerine Dream phases offer me Hybridization, but I decline with two swift fingers. This is the magical dawning of life and light. The repetitive nature of the tracks make them all blend into one movement, they all start to sound alike as I view the Lineage of Contactees, the majority probable C.I.A mind control victims. Nonetheless, the Mothership Jungles bring a beat to the vision, very much in the vein of The Keep soundtrack by Tangerine Dream. This is a definite headphone album and I would say that the listeners of Tangerine Dream and the likes would appreciate it very much.